It is Cinco de Mayo. Growing up as a Mexican-American kid in southern California, I had many “cultural dissonances” during elementary school. One example: At school, we celebrated Cinco de Mayo, but at home, we did not. This is not because my family did not care about Mexican or US history but because they focused on other challenges and successes. I know my Dad still talks about what happened in 1848. I could share my Dad’s thoughts about the subject, but that would take a long time. It would be easier to look into what Henry David Thoreau had to say about it. Cinco de Mayo became a celebration when a much smaller army (the Mexican army) defeated the French/Hapsburg regime in battle on May 5, 1862. The French won for a while, but eventually, the French were driven out of Mexico. This is an article I came across (Smithsonian Magazine) that shares some information about the city where the key battle was held: Puebla. To celebrate Cinco de Mayo, I thought I would celebrate my Mexican background by also using some of the delicious resources we enjoy around the Great Lakes. Good food meets good food! Cook the wild rice according to the directions on the package or you can use my mother-in-law’s recipe here. You can do this ahead of time, which I recommend. In a large sauté pan, heat the butter over medium heat. Melt the butter and add the garlic for about 1 minute. 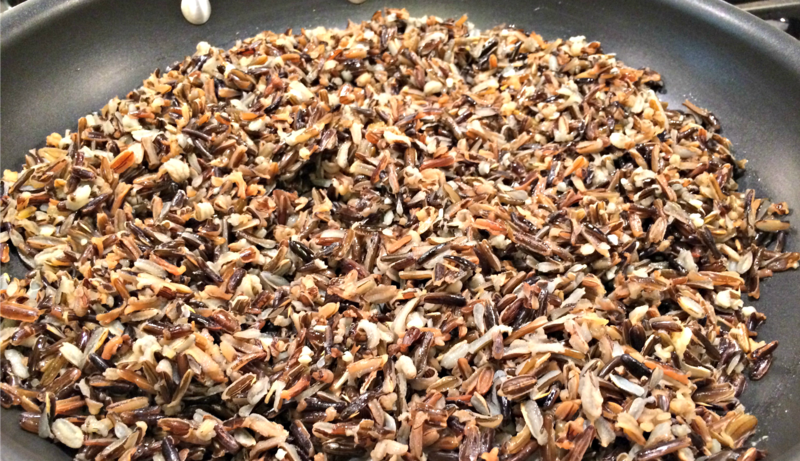 Add the cooked wild rice and stir until heated well. 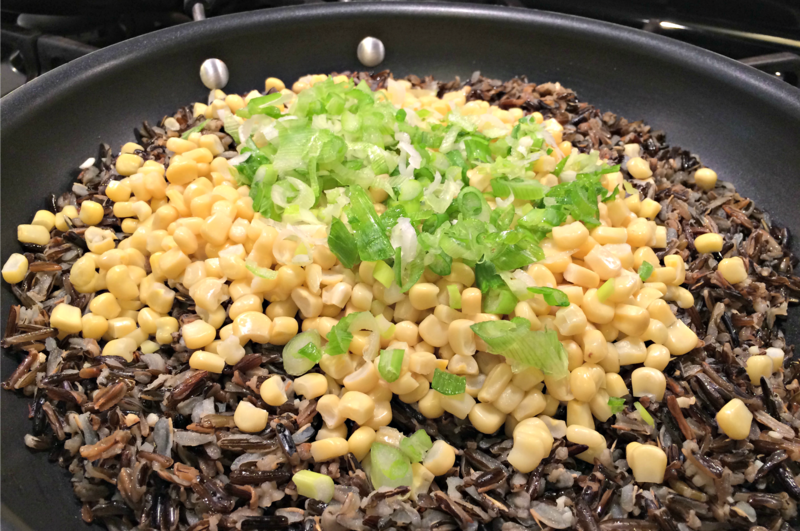 As the wild rice is reheated, add the corn and green onion. Cook and stir for a few minutes and then add the currants/raisins, broth, and orange zest. Bring to a boil and simmer until the broth has mostly cooked out. 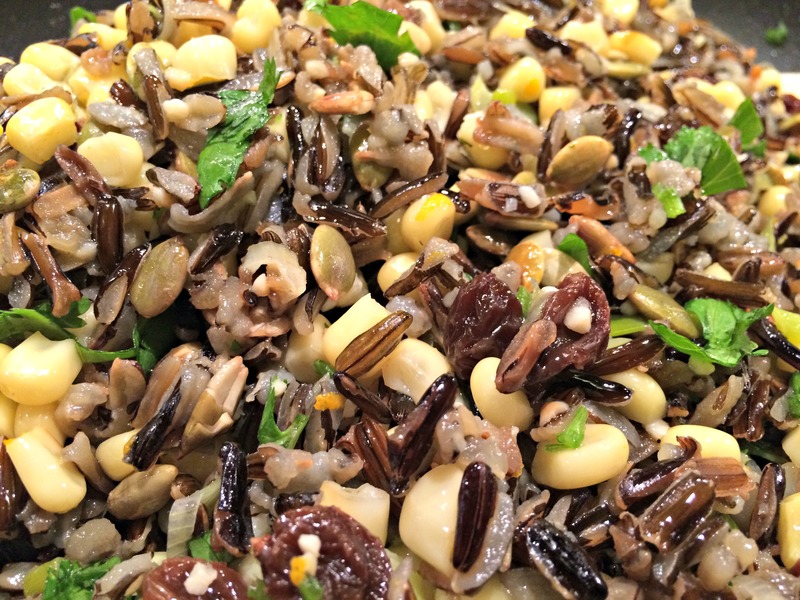 Stir in the cilantro, pepitas and add salt to your taste. Serve warm or reheat for 20 minutes in a 300 degree Fahrenheit oven. NOTE: I modified this recipe from the cookbook, Mexican Flavors by Hugh Carpenter and Teri Sandison, featuring recipes from San Miguel de Allende, Mexico. If you have time and are adventurous, try my version of Puebla’s signature dish: Mole Poblano. Check it out and give it a try! It is a delicious combination of some of my favorite foods. Another great looking (and sounding) dish guys! Would make a fabulous stuffing for roast chicken – what do you think? Thanks! And I think that is a great idea. I’ll have to give it a try. The few rules are here: https://thenovicegardener.wordpress.com/fiesta-friday/ and I think the badge is there, too. It would be fun to see this dish there! I have heard about Fiesta Friday on many of the blogs I follow. Even after all this time, I’m still learning how all of this works. I’ll give it a try. I’m glad you think this would be good to share. In my opinion, it is delicious! All the flavors work well. I’m glad you think so too. I bet these flavors work well with the earthy rice! 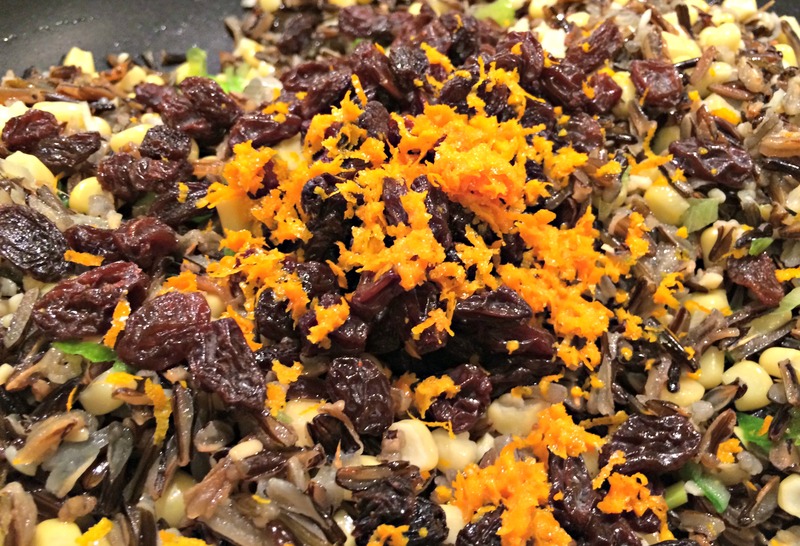 I love wild rice but I always think it needs a little something. Thanks for the recipe. Being part Irish and growing up in an Irish town, we didn’t really “celebrate” St. Pat’s day other than church. When we got older, we’d go to the parade with friends. I agree. Food should always be a part of every celebration, when it is possible.